Social media has been great for people to share their fun experiences of Blizzard 2016. It doesn’t matter if it is man or beast, everyone is finding a way to have fun in the snow on Saturday as accumulation total rose to and sped past of a foot of snow or more since Friday night. Nancy Widjaja showed off how some people in Columbia Heights, Maryland, entertained themselves with the snow streets. Wait until you see who joins them. Jacqueline Maxey, in Chantilly, Virginia, set up her GoPro camera to catch how the snow accumulated in her yard. The video shows how the powder stacked up on everything before overwhelming the camera. 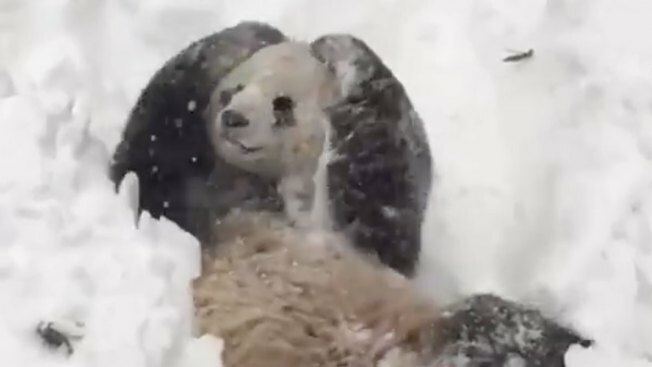 Tian Tian, the National Zoo’s giant panda, showed how pandas enjoy the snow, rolling down a hill and covering himself in the white stuff. Unfortunately, people won't get to see Tian Tian's snow dance in person, because the zoo is closed through Sunday because of the severe weather. But apparently, even giant pandas rolling in the snow are inspiring others to get out and frolic. Jeffrey Perez, in Millersville, Maryland, tried doing his best panda impression. Who was cuter? First responders in Washington have been working hard helping residents and trying to keep people calm during the snowstorm. However, it hasn’t been all work. Katie Tilley tweeted out some video of an impromptu football game between some officers and local residents. No word on who won the game. While the Washington Capitals were supposed to have two home games this weekend, both were postponed by the NHL for the safety of fans, workers and players. So Caps forward Brooks Laich, originally from Wawota, Canada, showed locals how Canadians do snow. Knowing Laich, who once stopped after a game and helped a stranded motorist change their tire, he may have been working on someone else’s driveway. News4's Trisha Thompson stopped by Glen Echo, Maryland, to see how much snow fell in the area. She decided a single image couldn't capture the scene properly. Instead, she took a 360 degree shot so the magnitude of the snow could be appreciated. Click here to see the Glen Echo photo sphere. For a 360 degree view outside the NBC4 studios, click here.